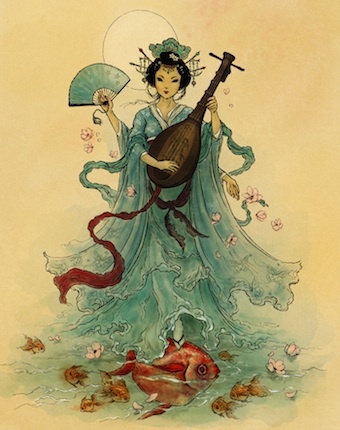 You will find her by the river or seated on a lotus flower, dressed in white and gold, radiant like the moon. In her hands she holds the veena, the vedas and a mala of beads. Lost in contemplation she sits alone with only peacocks and swans for company. She is Saraswati, the sublime Goddess of Knowledge. From her flows all learning. She is ‘Vac Devi’, the goddess of speech who ‘dances on our tongues’ to create the magic of words. It is she who incarnates as Art in all its forms. While Brahma is the Lord of Creation, Saraswati his daughter is Creativity itself. Saraswati means ‘to flow’, as is the nature of knowledge and creativity. It cannot be contained and must flow freely. Saraswati is also the Goddess of Purity, for the true purpose of knowledge is to purify the mind and lead it to wisdom. It is also the nature of a river to flow, to purify and to nourish. And, ultimately to merge with the ocean. 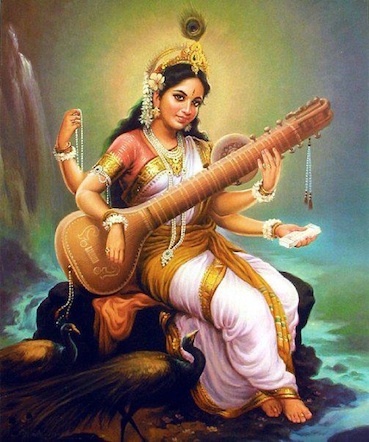 No surprise then that the Goddess Saraswati as we know her today started off as the holy river, Saraswati, which once flowed from the East to the West in northern India. Today only a small part of it remains as the Ghaggar river in Rajasthan; the rest of it long lost under the vast Marusthali desert. However satellite images and geological mapping show that the Vedic Saraswati was indeed an enormous river, about 1500 kms long and eight kms wide in her prime. Archeologists believe she played a major role in sustaining the Indus Valley civilization. Which explains why Saraswati is praised so lavishly in all the Vedas with several hymns dedicated to her. One hymn describes her as the ‘best of the mothers, best of the rivers, best of the goddesses’. The river was an important part of all Vedic worship and rituals and continues to be an integral part of Hinduism even today. Around 4000 BC when the Saraswati dried up, the people who had settled on her banks moved eastwards. Thousands of years later, by the time the Upanishads and Puranas were written, the River Ganges had become the most important river and the Saraswati had faded into a memory preserved in myths and stories. In the Mahabharat she is mentioned as the river which upon entering the desert ‘dived under it’ and disappeared into the sea. One story in the Puranas tell us how the Saraswati disappeared. Once upon a time the Gods wanted someone to carry Agni, the scared fire, to the sea. But, no mortal or god would dare to touch the fiery Agni lest they be burnt to ashes except the mighty Saraswati. At the request of the devas Saraswati gathered up all her waters and taking the form of a woman held Agni within her and rushed off to the sea. Agni’s fire was gone and so was Saraswati, lost forever to the sea. Another tale from the Bhagwat Puranas speaks of Saraswati being born from Brahma’s mouth. Wise and pure, she gave the gift of learning and knowledge to man. These stories tell of a major change in beliefs and rituals in post Vedic times. With Saraswati returning Agni to the sea the sacrificial fire appears to have lost its power. The material and animal sacrifices that were once offered to Agni came to be replaced by a sacrifice of self or the (ego), through the pursuit of creativity and knowledge. This transformation in attitudes is clearly seen in the Upanishads wherein Saraswati now becomes the Goddess of knowledge who leads man to the ocean of Truth. This idea of Saraswati was later incorporated into Jainism and Buddhism. Through Buddhism it spread beyond India to the far east. In Jainism, she became Saraswati, the dispeller of darkness and ignorance. Tibetan Buddhists know her as Yang Chenmo who bestows wisdom and learning. In Mongolian she is Keleyin ukin Tegri, in Chinese she is called Tapien-ts’ai t’iennu or Miao-yin mu, and in Japan she is Dai-Ben-Zai-Ten, meaning ‘the great divinity of the reasoning faculty’. Saraswati puja is celebrated on Vasant Panchami, the fifth day of the month of Magh which falls anytime from mid-January to mid-February. On this day all children place their books and musical instruments at Saraswati’s feet and seek her blessings while very young children will write their first letter in her presence with the help of an adult. She is also worshipped in a big way during the festival of Navratri, the nine nights of the goddess. This lovely prayer composed by Sage Agastya is chanted regularly by Hindus in their homes, schools and any place of learning. One who is adored by Brahma, Vishnu and Shiva and worshipped by all devas. Goddess Saraswati , I pray, dispel my ignorance completely. You can hear it sung here just as I learnt it in school. Anu, this is a good one.Enjoyed it and learnt a lot. Thanks Anushka. I am glad you liked it ! Love you too x. Just like in the Rig Veda, the essence of Saraswati captured beautifully in a verse ! Thank you. © Anuradha Gupta and All About Hinduism (since 2013) Unauthorized use and/or duplication of this material without express and written permission from this blog’s author and/or owner is strictly prohibited. Excerpts and links may be used, provided that full and clear credit is given to Anuradha Gupta and All About Hinduism with appropriate and specific direction to the original content.